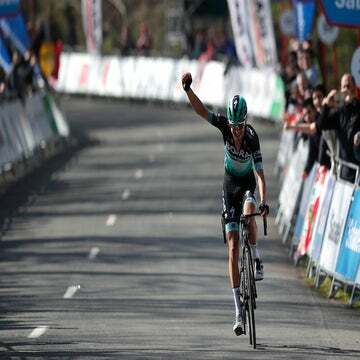 Max Schachmann (Bora-Hansgrohe) dominated the uphill sprint to win stage 3 of Tour of the Basque Country, Wednesday. 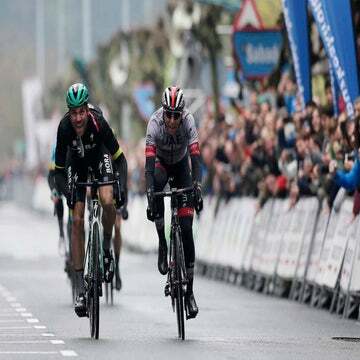 The German took the long line around the draggy final incline to come around the competition and beat Diego Ulissi (UAE-Team Emirates) and Enrico Battaglin (Katusha-Alpecin) into second and third place, respectively. 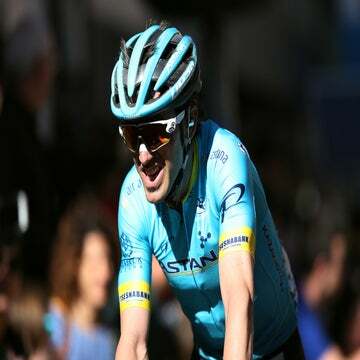 Schachmann, who went into the day in the yellow leader’s jersey, was able to profit from a crash in the bunch with 5km to go that took down stage 2 winner Julian Alaphilippe (Deceuninck-Quick-Step), who looked to have injured his wrist, as well as Michal Kwiatkowski. As well as being legitimate contenders for stage victory, the pair lay second and third in the overall. Enric Mas — another key GC contender for Quick-Step — was also taken down. A number of crashes blighted the early part of the 191-kilometer route, which contained two categorized climbs. Rohan Dennis (Bahrain-Merida) and Steve Cummings (Dimension Data) both came down and later abandoned. A breakaway of seven formed early in the day, and lasted until the final 5km of the race, at which point Mitchelton-Scott was taking up the pacemaking, looking to keep Adam Yates safe and in contention having lost time after a puncture on stage 2. A large group came to the final kilometer together, and Schachmann kept himself near the front of the bunch throughout. The German rider powered clear with around 500 meters to go on the 1.4km, 4-percent drag to the line, and looked untouchable as he took the victory. The crash that took down so many of the favorites seemed to come about after a touch of wheels, and saw Quick-Step team-time-trialing Mas back to the peloton. However, the Spaniard still came to the line over 1:40 down. Both Kwiatkowski and Alaphilippe were able to finish the stage, but both lost significant time. Schachmann is currently 33 seconds in front of Astana’s Ion Izagirre and Bora teammate Patrick Konrad, both who are on the same time. The next two stages are both lumpy, with Thursday’s stage 4 being riddled with climbs, and the summit of the last coming with only 5km to go, before a descent to the line in Arrigorriaga.